Boris Bally, photo by Scott Lapham. A Pittsburgh native, Boris Bally received a BFA in metals from Carnegie Mellon University. Not afraid to take on the “form versus function” dilemma, Bally is a master of blending fine craft and popular culture. His work is both witty and innovative, employing the use of jeweler’s skills on non-precious materials. His current body of work transforms recycled street signs, weapon parts, and a wide variety of found materials into objects for reflection. These pieces celebrate raw American street aesthetic in the form of object, often useful, for the home and body. 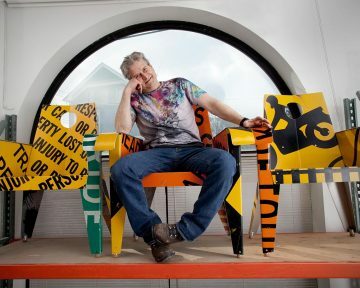 Bally has won numerous awards—he just received the 2015 RISCA Fellowship in Craft, led many visiting artist workshops, and exhibited nationally and internationally. His work is included in the Renwick Gallery, National Museum of American Art, and Museum of Fine Arts, Boston, among many other venues. Aluminum platters, hand spun, fabricated, pierced, riveted, 25.5 x 3 in.